To use: Scoop out a small amount, apply to a wet face, scrubbing gently in circles, especially in your T Zone area. Let is sit for 5 minutes. Rinse well, this can also be used on rest of body. 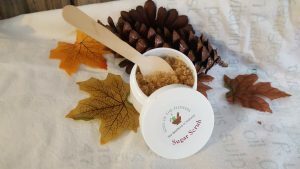 Sugar is a natural exfoliate, while honey is a hydrating antioxidant. Emotionally and spiritually, peppermint essential is uplifting and rejuvenating to the heart and mind. Peppermint Oil is cooling on the skin, keep away from eyes.